Stocks ended a choppy day in the red Monday as concerns about emerging markets and corporate earnings kept investors on edge. 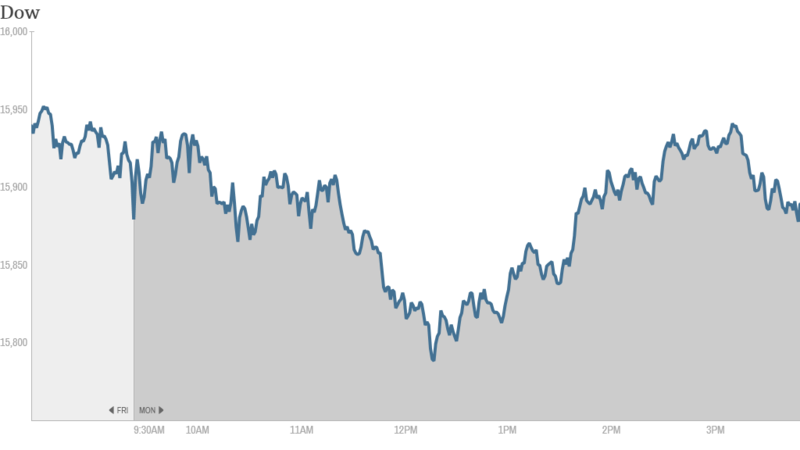 The Dow Jones industrial average and the S&P 500 were both dragged lower. But losses were offset by gains in Caterpillar (CAT) shares. 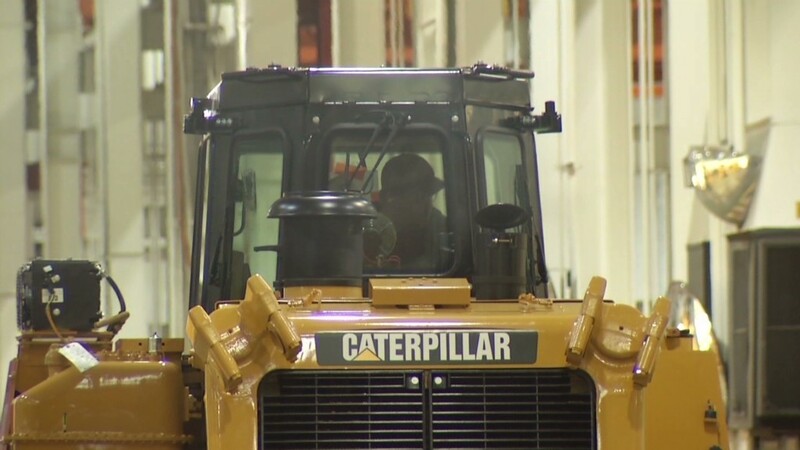 The construction equipment giant reported strong quarterly results and approved a new $10 billion stock buyback program. The Nasdaq slid more than 1% on declines in shares of biotechnology companies such as Celgene (CELG) and Alexion Pharmaceuticals (ALXN). The PowerShares QQQ Trust (QQQ), a widely-held exchange-traded fund that tracks the Nasdaq 100, is now down more than 2% for the year. And some are worried that the ETF will fall even further. "$QQQ is teetering on the edge. We may see a sizable correction begin to unfold," said StockTwits user OptionsElite. And CNNMoney's Tech 30 index fell on weakness in shares of social media companies Twitter (TWTR), Facebook (FB) and LinkedIn (LNKD). Weak revenue guidance from Apple (AAPL) following the closing bell could weigh on the market on Tuesday as well. Shares were down 5% in extended trading even though earnings topped forecasts. The stock in regular trading Monday on hopes of strong iPhone sales. Last week was a rough one for stocks. The Dow shed around 2% Friday to end the week down 3.5%. The Nasdaq and S&P 500 both closed more than 2% lower Friday. The market's so-called fear gauge, the CBOE Market Volatility Index, or VIX (VIX), shot up 25% on Friday, the biggest one-day percentage jump since last year's Boston Marathon bombings. The VIX was down nearly 6% on Monday as the stress eased. But CNNMoney's Fear & Greed index, which looks at the VIX and six other gauges of sentiment, hit a level indicating "Extreme Fear" in the market Monday. Is a correction brewing? Many investors say stocks could be headed for a correction, typically a drop of 10% or more. Following last year's big rally, stock prices -- as measured by how they trade relative to expected earnings -- have risen to levels that are considered slightly expensive. Jack Ablin, chief investment officer at BMO Private Bank, said stocks could slide further if corporate results fail to move the needle. "If earnings and revenue don't move at all, the market could drop 10% or more," he said. While "valuations are a bit stretched," Ablin still expects 2014 to be "incrementally positive" for stocks. So far, corporate earnings have beaten analysts' modest expectations. Of the 123 S&P 500 companies that have reported results through Friday, 68% have had earnings above expectations, according to FactSet Research. Investors will get results from 130 of the companies in the S&P 500 this week. The stock was also one of the top performers in CNNMoney's Tech 30 index. In economic news, new home sales plunged 7% in December from November, according to the Commerce Department. December new home sales were up 4.5% from a year ago. New home sales data can be volatile, and some of the drop could be due to colder-than-normal temperatures last month, said Jim O'Sullivan, chief U.S. economist at High Frequency Economics. Emerging markets in turmoil. Meanwhile, emerging markets extended their recent losses Monday amid worries about an economic slowdown and liquidity shortfalls. Emerging markets have ridden a wave of liquidity over the past few years as central banks in the developed world, including the Federal Reserve, have pumped money into the global economy. But as the Fed begins to scale back its bond buying this year, investors have been pulling money out of emerging markets, prompting some central banks to intervene. The Turkish lira regained some ground Monday after Turkey's Central Bank announced plans to hold an emergency meeting Tuesday. The Argentinian peso has been under heavy pressure since the nation's central bank devalued the currency Thursday in a bid to jump start growth. India's rupee has also been hit hard. Investors have also been worried about China, the world's second largest economy, following a disappointing report on manufacturing activity last week and ongoing worries about the nation's financial sector. Despite the flight from emerging markets, the market panic does not appear to be spreading. "Does look though to just be $EEM contagion and not something much worse, overall paradigm doesn't seem to have changed," said LDrogen on StockTwits. Still, the iShares MSCI Emerging Markets ETF (EEM) is down nearly 10% so far this year. European markets ended lower following heavy losses in Asia overnight. Corporate news: Google (GOOG) announced it acquired London-based artificial intelligence firm DeepMind Technologies. It's the latest in a series of start-up purchases by the tech giant as it looks to beef up its expertise in artificial intelligence and robotics. Google shares were down 2%, adding to a steep slide over the past few days. One trader said investors were selling Google shares to buy Apple in anticipation of strong results. "Anyone who thinks biggest $GOOG selloff in recent memory not connected to $AAPL ER is delusional. Everyone going to cash, just waiting..." said kleo. Another trader warned that speculating in Apple shares ahead of earnings reports can be dicey. And based on how Apple was faring following its release, that trader turned out to be right. "$AAPL Investors have got burned with 'sell the news' with Apple on many announcements and earnings. More often than not," said betachaser. Sony (SNE)shares slid after the firm's debt rating was downgraded to 'junk' by Moody's, with the agency warning that profitability at the tech company would likely remain weak and volatile. Shares of Vodafone (VOD) tumbled after AT&T (T) said Monday it would not purchase the British telecom company. There had been recent speculation that a bid was imminent.